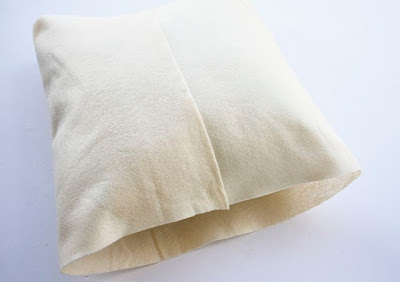 This will show you how to make a basic, easy envelope pillow, which is boring but . . . ever so useful. Make one, and next week we will do something totally unique with it. An envelope cover allows you to make a removeable cover without using a zipper and is my new best friend since I lost my sewing machine zipper foot somewhere in the early '80s. 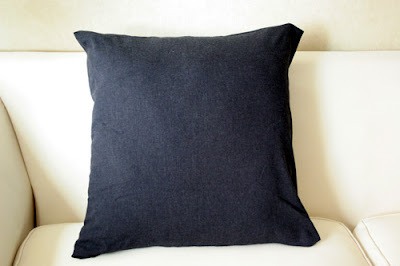 At its simplest, an envelope pillow cover requires only two seams. Here's a felt one from Ruffles And Stuff. Cut a long rectangle of fabric. Fold and fold. Sew. 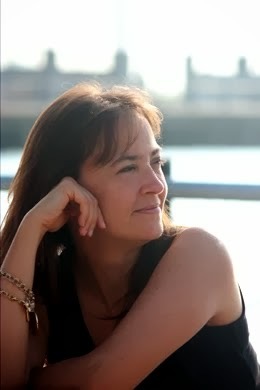 Here's a fabric one from DIY Maven. She folded under two edges to make a quick hem. Now mine. I'll show you how to make a regular hem, which is a bit more work, but considering the fabulousness that we will be putting on the front of this cover next week, you want to have the option. 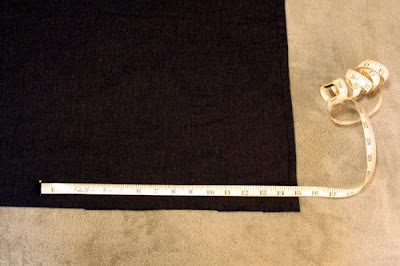 The width should be the width of your pillow plus 2"
The length should be double the length of your pillow plus 8"
The fold lines should be half the length of the pillow plus 3", measuring from the edge toward the center of the pillow. 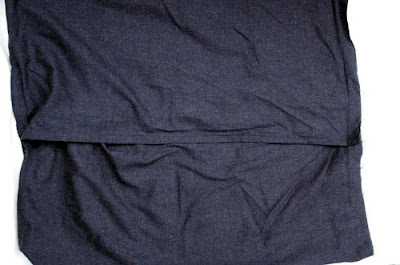 For our 24" pillow, cut a rectangle of fabric 26" wide and 56" long. We will hem the two short sides of the rectangle with a double hem. 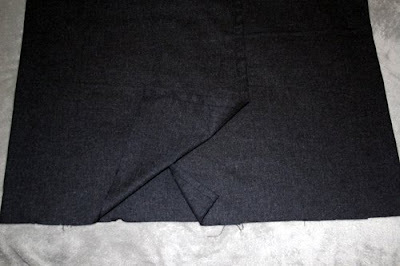 Fold the end over toward the wrong side of the fabric 1/2 inches and iron. Fold in again another 1/2" and iron. Sew along this seam. Do the same on the other short end of the rectangle. 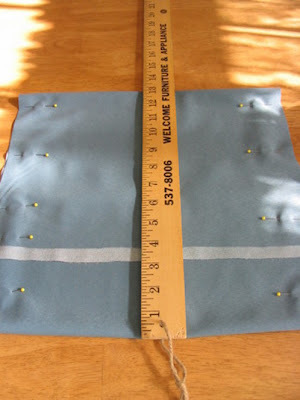 Lay your rectangle flat with the right side of the fabric facing up. Measure from the end in toward the center 15" inches and fold over. Do the same on the other end. 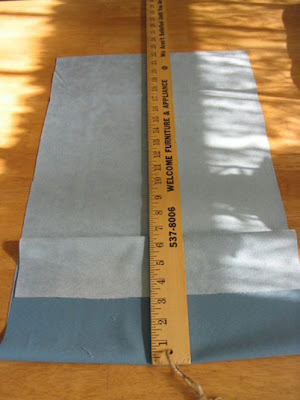 Your fabric will overlap about three inches. Sew up the two side seams with a one-inch seam allowance. 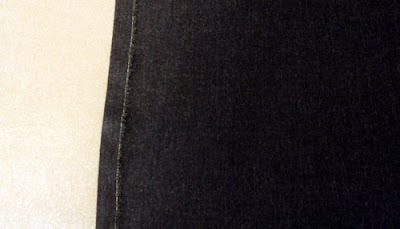 Trim the excess seam allowance. Turn the pillow cover right-side out and insert pillow. p.s. Don't forget the lace jewelry holder giveaway. I like it when things are this simple. In my house, if something isn't done in one sitting it won't be done. Mine won't stay entirely closed, stuffed as they are with random fabric, so I may have to tack them shut with a button or velcro. And they are deadly boring (though useful), so I look forward to seeing how you make them fabulous.